Fujitsu Optical Components on February, 2016 will be releasing the world’s first Dual Carrier LN Modulator supporting 200G DP-QPSK and 400G DP-xQAM modulation formats for beyond 100G optical networks. Twice the transmission capacity of conventional LN modulators is achieved by integrating two compact sized DP-QPSK Mach-Zehnder modulators into one package. Internet services such as cloud computing have led to a rapid increase in the volume of communications traffic. The arrival of the IoT (Internet of Things) age will further accelerate the volume of communications traffic in the future. This has led to the spread of 100G optical networks and increased demand for next-generation beyond 100G optical networks. The requirement for core and metro networks to handle larger capacity and longer distance on their links has resulted in the expansion of 100G optical networks using digital coherent transmission systems. FOC has successfully commercialized the world’s first Dual Carrier LN Modulator supporting 200G DP-QPSK and 400G DP-xQAM modulation formats for beyond 100G optical networks. 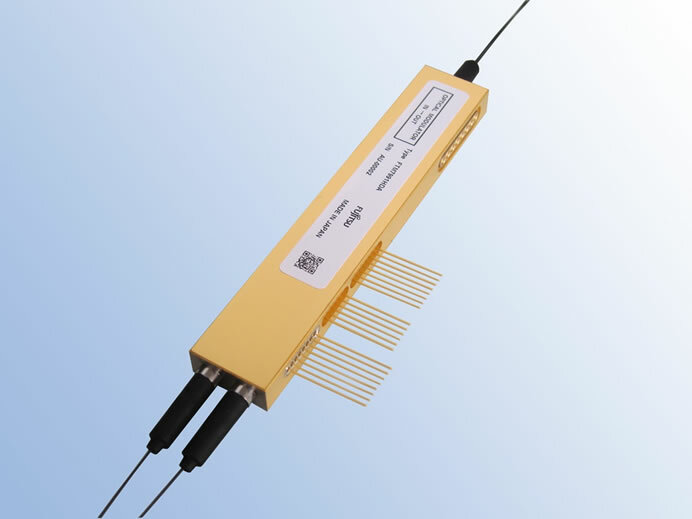 This product integrates 2 DP-QPSK Mach-Zehnder modulators into 1 compact package to achieve twice the transmission capacity of conventional LN modulators. This product will help facilitate compact, high performance, low power consumption optical network equipment for 200G/400G optical networks.